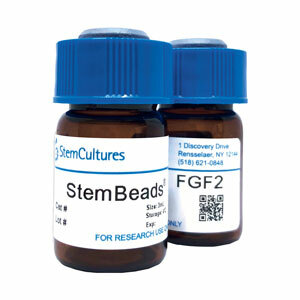 We have been using StemBeads FGF2 for ~2 years on our iPSCs. Our cultures have very little spontaneous differentiation with a significant reduction of media usage. I could not imagine going back to daily feeding! I use StemBeads FGF2 on both ESCs and iPSCs and the cultures look great with little differentiation. I have been using the beads for a little under a year and I have found them very consistent and reliable. Incorporating the StemBeads FGF2 into the media is such a quick and simple procedure and produces high quality cultures while saving both time and money. Not having to feed every day and having great quality cultures is the best of both! I help maintain several different iPSC lines, which can be quite time consuming. Working with FGF2 beads from StemCultures significantly cuts down on my feeding time, and allows me to focus on other tasks! Moreover, when an experiment calls for a high cell confluency, I can rely on this product to hold back the spontaneous differentiation. Our lab has been exclusively using StemBeads as our standard protocol for maintaining, expanding, and differentiating hiPSCs and hESCs for over 4 years. StemBeads provide a much higher level of control of our cell cultures while maximizing efficiency within the lab e.g. decreased labor via eliminating daily media changes/feeds. Highly recommend StemBeads to anyone who values their time and the quality of their cultures!